Sterling Shores PH13-Upgraded 3bd condo w/ gulf views! Beach side pool, lagoon pool, fitness room, & movie theater! Free Wifi! You must really see this unit to believe how beautiful it is. Penthouse 13 was professionally decorated with not a single detail overlooked. Enjoy many beautiful gulf views from this remarkable three bedroom two bath condo. Sterling Shores is a great property in the heart of Destin close to The Back Porch restaurant. This amazing property features a large master suite, large master bathroom w/ stand up shower and whirlpool tub. Penthouse 13 features two guest bedrooms. One with two twins and the other with a full sized bed. TV’s are located in all bedrooms and the living room. A guest bath is located by the guest bedrooms. Convenience is everything while on vacation, so to make life easy, PH13 has an actual laundry room in the condo. Enjoy cooking and conversing with the whole gang as the kitchen/dining/living room all have an open concept. This also means you get to enjoy those gorgeous emerald green waters from the kitchen, dining area and living room! AND also from the master bedroom and the extended balcony. Wanting to really get that resort feel? Sterling Shores is where it’s at!! Choose between two pools (one of which is directly on the beach!!) a lagoon pool which is beautifully landscaped and features a zero entry area and mushroom water fountains (about 4,300 sq. ft.) and the oasis pool is heated and directly on the beach!! The beach side pool has plenty of seating, seasonal snack bar, and cabana with bathrooms. Sterling Shores also has a designated beach near the beachside pool. Beach vendors are also available for additional fees such as chair rentals, jet skis, etc. A local’s favorite, The Back Porch, is directly next to your beach meaning you can easily enjoy a cocktail or a quick snack. Their gumbo is excellent too! Just a few things that Sterling Shores offers you during your stay is high speed internet in your room, private gulf-front beach club including oasis pool, private balconies, 42-seat surround-sound theater, awesome barbecue area right near pool, seasonal beach rental service (fees apply), and a gated entrance. 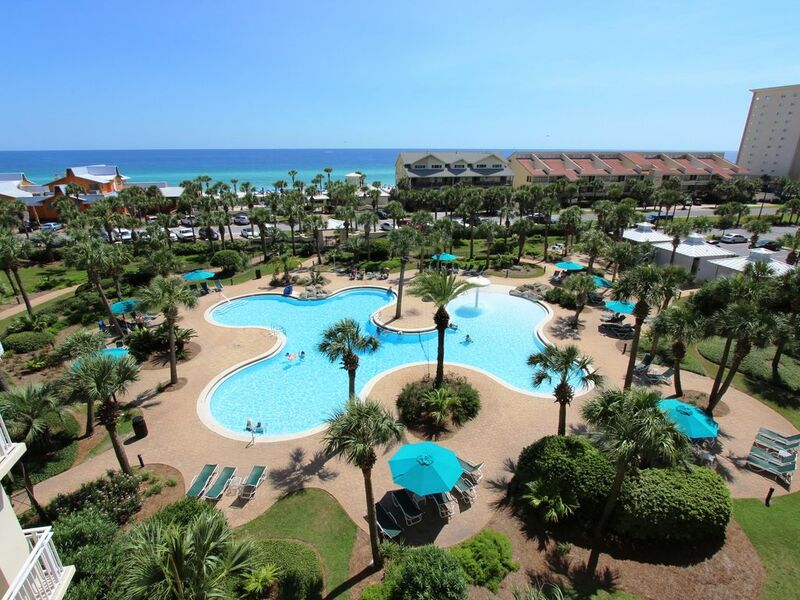 Sterling Shores is located in downtown Destin. It is very close to many restaurants and shopping and the popular Big Kahuanas water park as well as the The Track!! Yes! Your private beach access is just steps away! This is a beautiful resort with lush landscaping throughout, access to two pools with fun features, grilling area, private beach access, movie theater, fitness center and free wifi. Gorgeous beach views from the living room, kitchen, dining area, master bedroom and extended balcony!! All linen is provided w/ the exception of beach/pool towels. Enjoy one underground parking spot in the garage and additional cars will park in regular parking lot. Enjoy beach views from the living room. Sofa sleeper located here as well. Fully equipped kitchen w/ all modern appliances & enjoy beautiful beach views too! Large dining table to seat six comfortably and also two additional can be seated at the bar, right next to the dinner table! Private balcony extends from living room over to master bedroom. Kayak rentals are available throughout Destin. Boat rentals are available throughout Destin. Sterling Shores has TWO great pool areas. Enjoy the lagoon style zero entry pool with mushroom waterfall and also the second pool which is located beach side! Destin is less then 15 miles long and two miles wide, so where ever you decide to stay, you are still pretty close to everything. Enjoy all the shopping, dining and beaching you can while having your toes in our sugary white sands!